« As goes the Sun so goes the Earth. The Sun is Daddy. 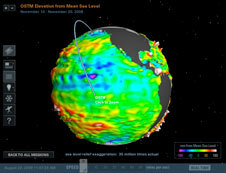 To use this web based 3d Earth viewer you’ll need to install the plugin. It might mean restarting your browser. I’m using Firefox (on a PC and Mac). I had serious troubles with the “full screen” mode so I’d avoid that like the plague as it required the Ctl-Alt-Del Vulcan Nerve Pinch to get back control of my computer. The view had impolitely changed the screen resolution of my 2560×1600 30″ display to some much lower setting WITHOUT my permission when it switched to full screen! Yikes, when will programmers learn to be polite and ask permission? Also, caution should be used since this plug in might break the flash tools already installed; at least since installing it my WordPress flash tools have been acting weird. 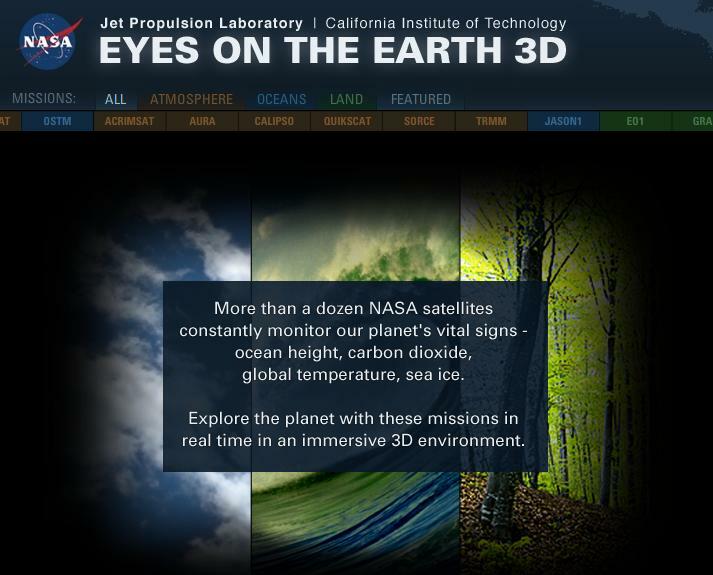 NASA’s “Eyes on the Earth 3D” is back and better than ever before. This online experience now offers new features that allow users to view the latest data beamed back from NASA space satellites – in some cases, less than a few hours old. 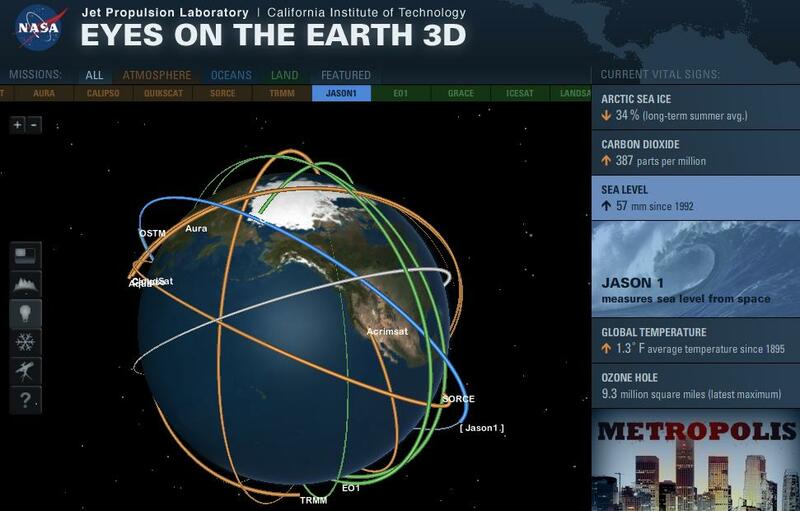 Developed using a state-of-the-art, browser-based visualization technology, “Eyes on the Earth 3D” displays the location of all of NASA’s 15 currently operating Earth-observing missions in real time. * Fly along with a satellite as it sweeps the Earth below in accelerated time. * Compare the size of each spacecraft to a car or a scientist. 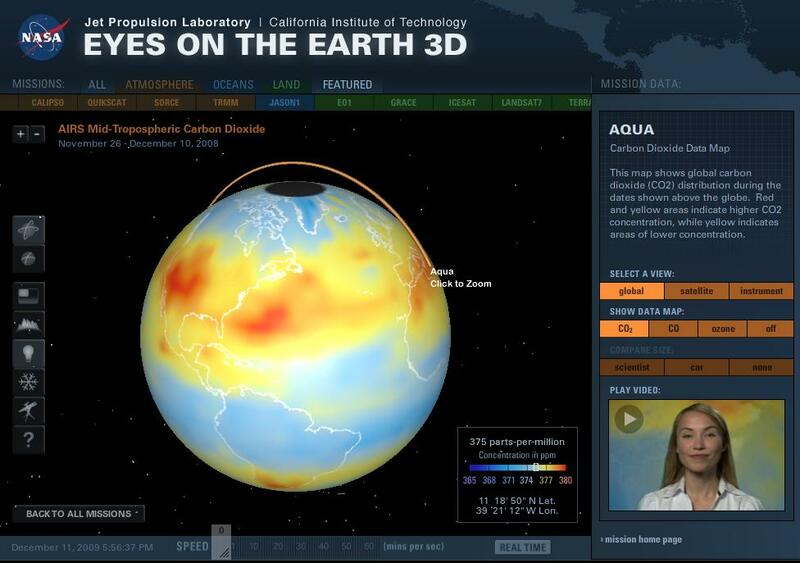 A quick overview video to see what “Eyes on the Earth 3D” is all about and some of what you can do with it. Very nice. Excellent science education tool. Kudos to NASA! Now where is the access to the live raw data? 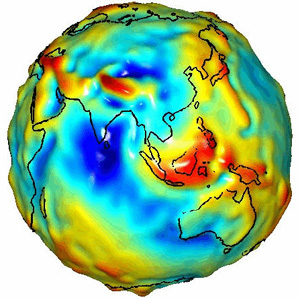 How can I get it streaming into my own model of the Earth? 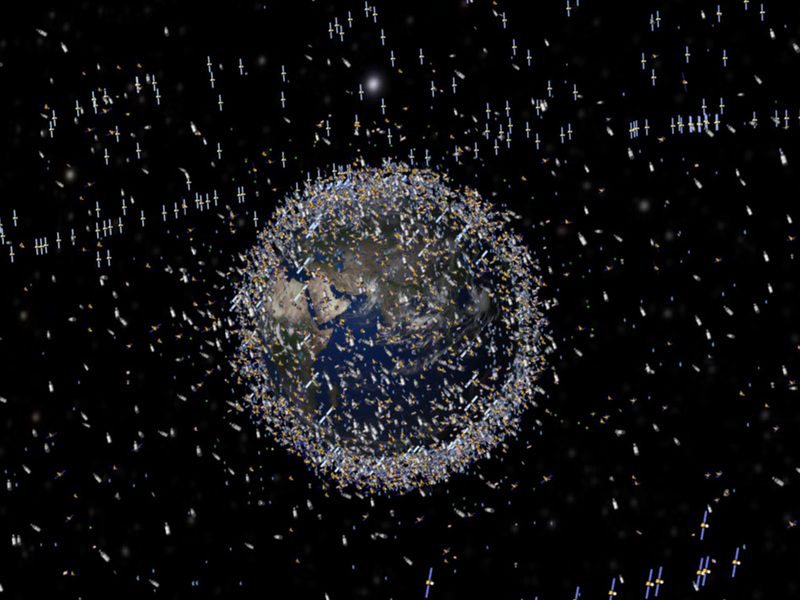 Now of course there are a lot more (earth observation) satellites in orbit as this image shows. Where do we get the data for those that make it available? Hmmm… anyone care to post links in the comments? 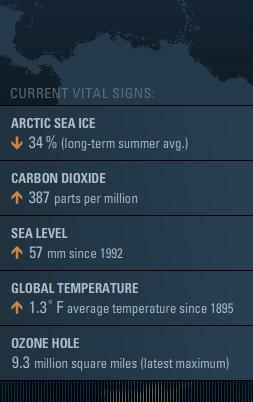 The Nasa “Eyes on the Earth 3D” page also has a “current vital signs” info display. I wonder how that data is calculated. Again it’s not that the data is wrong, but I want to see how it’s calculated and where it comes from and what manipulations have been done and how they justify it’s values though time and what is their science behind it. Simple really, educate me so that I can audit the work! Watts Up With That has a widget that also shows some of the current vital signs. Actually they do show a couple more details, which satellite for example, when you mouse over the satellites as they orbit the Earth in the 3D viewer. More details NASA please, more details… all of details! Please. 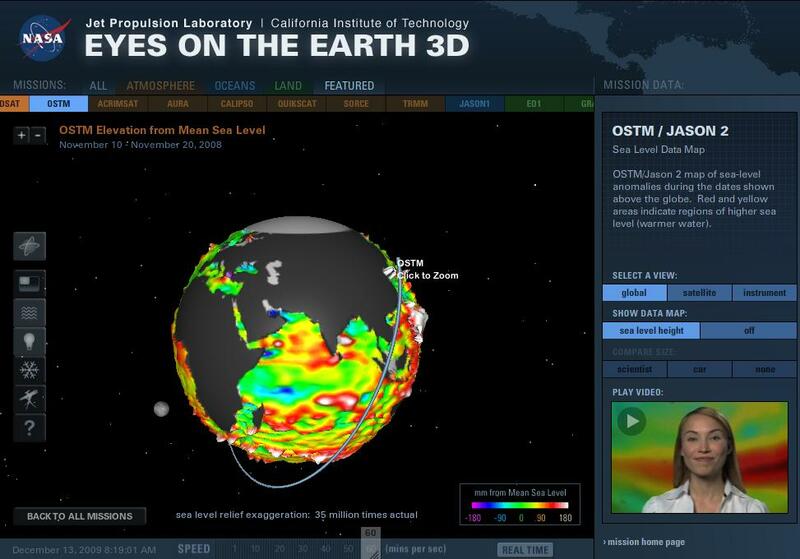 You can get some extra data mapped onto the Earth 3D model from the “Featured” satellites. One of these are CO2 readings that they claim are about 3 to 4 hours old. Interesting. No it’s not a horror movie, it’s the Jason 2 satellite and it’s friend the OSTM satellite. The ocean levels satellite views sure look cool. Love to see the raw data though plus their manipulations and their justifications for their manipulations. Overall I think that lots can be learned by studying the data coming from these satellites, after all that is what they are for. However, NASA clearly has a bias towards the AGW Hypothesis as indicated by the rather large link to the Nasa Global Climate Change web page. Bias doesn’t look good Nasa. PROVE your claims with actual science that is sound and not based upon ANY of the corrupted data from the Climategate alleged scientists Jones, Mann, et. al. or the corrupted temperature data sets involved! Imagine, if Peter, a sixth grade student, along with his Dad, a biologist, can make significant findings in the public GISS temperature data regarding the existence of the Urban Heat Island Effect (UHIE) and contribute to our understanding of the climate of Earth and Climategate and essentially provide an excellent falsification of the AGW Hypothesis, imagine what you could do with the data from these satellites. Get out your thinking caps, learn, think and contribute your insightful genius. This entry was posted on December 10, 2009 at 4:43 am	and is filed under Adventure, Awesome, Big Brother Planetary Control System, Climate Science, Climategate, Complex Systems, Evil Walks the Earth and Carries a Big Stick, Exercise for the Reader (that's you), Get some perspective people, Graphics, Gravity, Hard Science, Hard Science Required, Humbled by Nature, Ignorance to Knowledge, It's weather AND climate!, Learning about Science Organizations, Majestic Universe, Math, Proofs, Proofs Needed, Rational Thinking, Reality Based Environmentalism, Science Ficition, Science Missions, Science over Propaganada, SkyNet Battlefield Earth, Total Control Over Our Lives, Video, WOW!!!. You can follow any responses to this entry through the RSS 2.0 feed. You can leave a response, or trackback from your own site. He was the main person behind all success.